You must always yield the right-of-way. You must tell them where to cross the street. You only have to yield the right-of-way if you are at a corner. Blind or partially blind pedestrians may carry a white cane or use the assistance of a guide dog. You must always yield the right-of-way to a pedestrian who is using a guide dog or carrying a white cane. 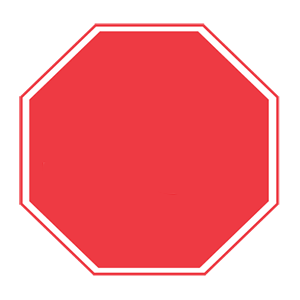 Regulatory signs provide notice to road users of traffic laws that must be obeyed. 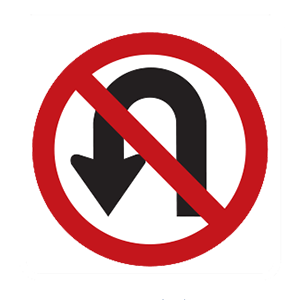 This sign tells drivers that it is prohibited to make a U-turn. If you entered the intersection on the green light. Even if the light is green, you may not enter an intersection unless you can get completely across before the light turns red. If you block the intersection, you can be cited.